I spend a lot of time in Perry Lakes Park where I am the environmental advisor. Thomas H. Wilson - 1989- recipient of the W. Kelly Mosley Environmental Award for Achievements in Forestry, Wildlfe and Related Resources. This is the highest environmental award given by the State of Alabama. 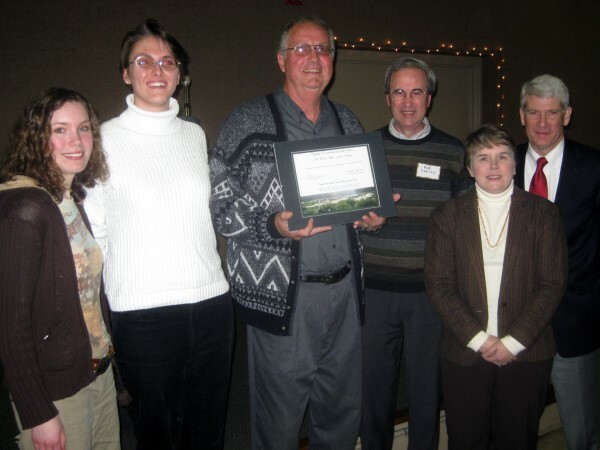 Dr. Thomas Wilson was honored in 2009 by the Cahaba River Society as "Cahaba River Conservationist of the Year." Left to right: Lauren Stephens (Judson College grad), Angi Gullard (JC grad), Wilson, Dr. Robert Corley, President of CRS, Dr. Sara Kiser (JC Dean), Dr. David Potts (JC President). 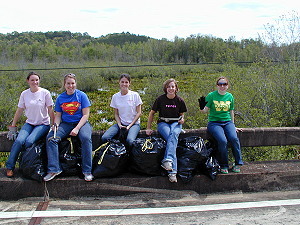 Samantha Marcella, Laruen Stephens, Jill Copeland and Tonya Morgan learn many skills in their Earth Team projects. This is one of many signs they have constructed and installed in Perry Lakes Park near Marion, AL. This Eastern Lesser Siren was captured from Donavan Lakes Fishing Club lake. Visit the site to learn about this strange aquatic salamander. 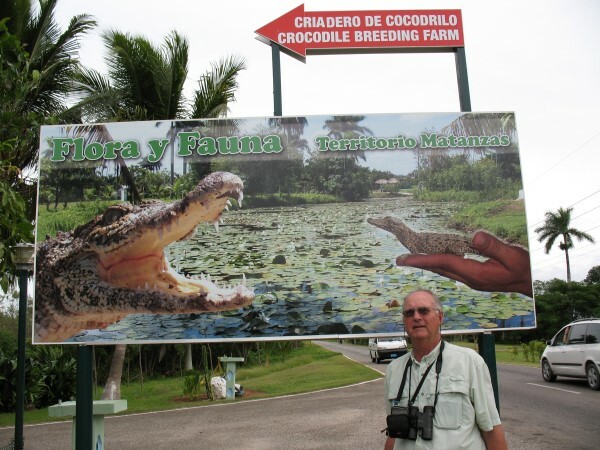 Dr. Thomas Wilson at the Zapata Swamp Crocodile Farm in Cuba, Nov. 2009. 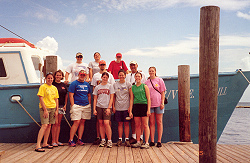 Wilson attended a wetland symposium at the Bay of Pigs. 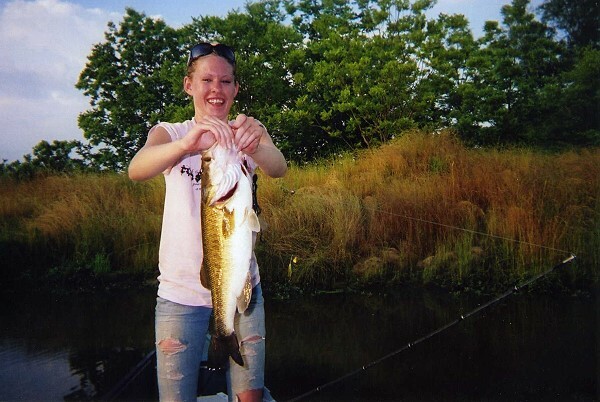 (I also did some wonderful birding and freshwater fishing. 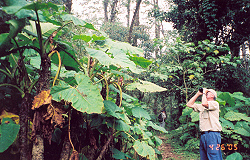 Tropical Ecosystems of Costa Rica is a study abroad course for Judson College. Thomas Wilson was the guest of honor at at the CATIE University of Costa Rica's Tropics Foundation meeting in Atlanta on the 29th of September. CATIE has invited Judson College to join the "Friends of CATIE" program which will open many doors for Judson students in the Study Abroad program. 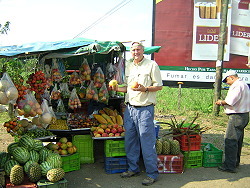 We did enjoy those mangos! 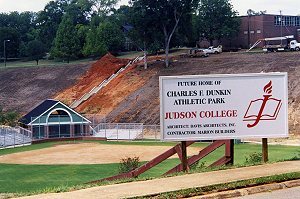 The Charles E. Dunkin Athletic Complex is completed (2008) at Judson College. 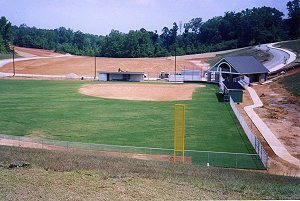 Softball, soccer, and equitation have a new and exciting home. 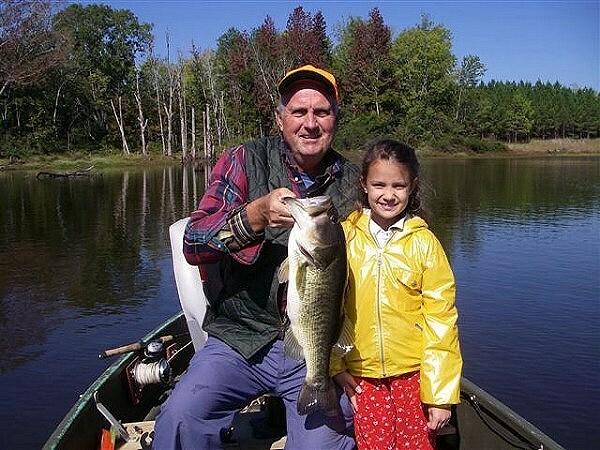 Great uncle Thomas with great niece Rachel Wilson, Heber Springs, AR., and a big Perry County, AL bass. Oct. 06. 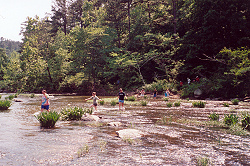 Click on above image for larger view Wading in the Cahaba River with the lilies. 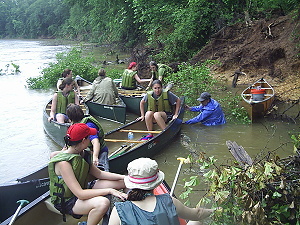 Canoeing the Cahaba with students has been a tradition with the Judson biology department for 30 years. 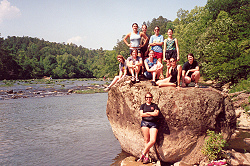 Many lasting memories of the beauty of nature were aquired on these trips. We learn from the river... we have fun on the river...and we give to the river. 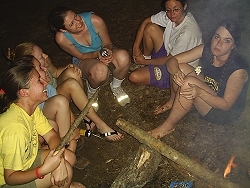 Judson students enjoyed a trip to the Sipsey Wilderness. 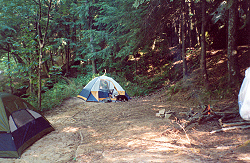 Camping in the Sipsey Wilderness on an ecology field trip. 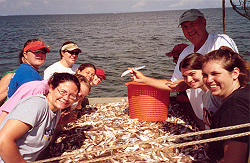 Dauphin Island Sea Lab marine ecolgoy trip Learning marine biology. Dr. Wilson conducting his routine..."What is this" quiz... never stop teaching! 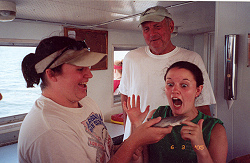 Dauphin Island Sea Lab "shark experiment"...the shark won. 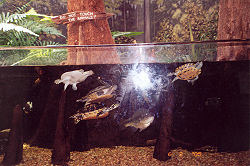 The Estuarioum at the Sea Lab is a great learning experience. 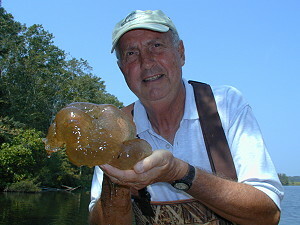 Wilson with a blob of bryozoa called moss animals from a pond near Marion, AL. 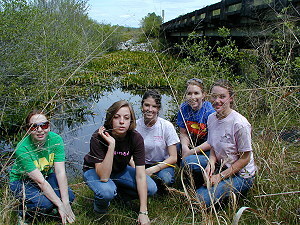 The Judson College Earth Team planted the treescape for the Marion Rural Studio Learning Center project (Dec. 2005). 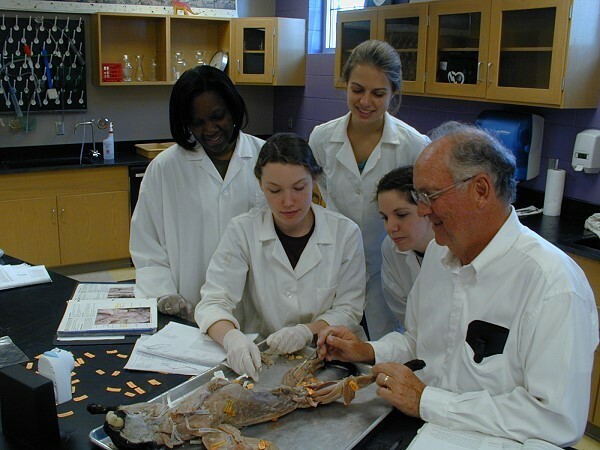 Here I am in comparative anatomy lab with some very smart Judson College biology majors. These students had placed pin labels on every muscle of the cat in preparation for the big lab exam. 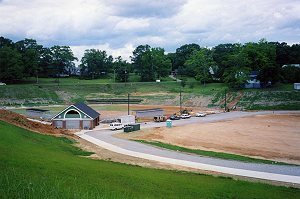 There are only four public boat ramps (canoe put-in/take-outs owned and maintained by the State or County) on the Cahaba River south of Birmingham. 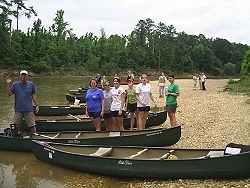 One of the most popular canoe trips on the Cahaba is from the Sprott Bridge on Hwy 14 near Marion to the Radford take-out on old Perry County 30. The bridge at this take-out collapsed about 35 years ago and the the bank was an eroded, almost dangerous ditch. Perry County Engineer's Department recently constructed a canoe and small boat access ramp at the old Radford bridge location. See the images and read about the struggle for this Cahaba Access by selecting the Radford Ramp Project at the right. 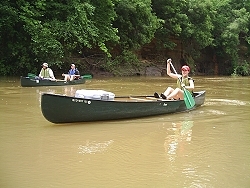 The West Alabama Sierra Club visited Perry Lakes Park in March, 08. Dr. Wilson was the study tour leader. Wilson served as "gandpappy" for Christian Fowler in order for her grandmother, Lisa, and great aunt, Lila, to climb the 100 ft. tall birding tower. The Sierra Club nominated a Florida Maple from the Park for the Alabama State Champion Tree Program. 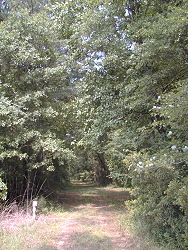 This environmental group also has adopted the Park as a Club preservation project. The Golden Club Swamp is an ecologically significant area in Perry County, AL, that should be protected and promoted for its beautiful lilies and for its interesting birding. 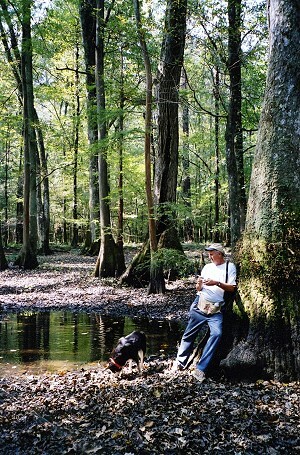 An effort is being made to add this site to the growing list of ecotourist hot spots of West Central Alabama. 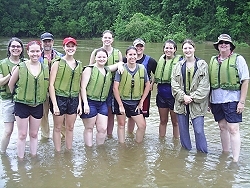 Judson College students enjoy visiting this unusual arum lily ecosystem. In addition to learning about the lilies, they always pick up litter and garbage thrown into the area by ignorant people. 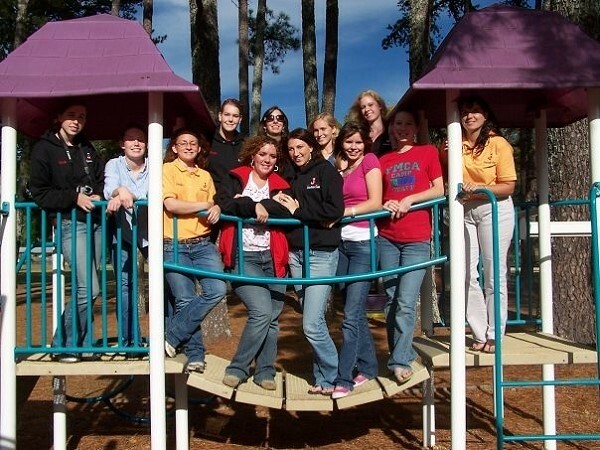 Lauren Stephens, Kary Reeves, Channing Newton, Megan Brown, and Tiffany Jernigan of Judson College. The approximate 600 contiguous acres associated with Perry Lakes Park need legal protection from alteration of the ecosystem to safeguard the outdoor treasures of this wonderful natural area. 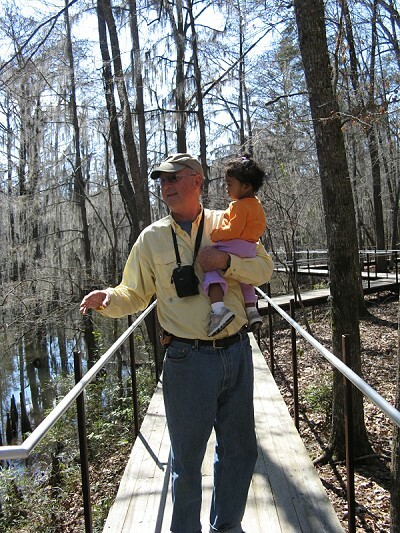 This outdoor ecotourism area includes the Marion State Fish Hatchery (woods and ponds), Perry Lakes Park, the new Aquatic Biodiversity Laboratory, and Barton's Beach Cahaba River Nature Preserve (owned by The Nature Conservancy).